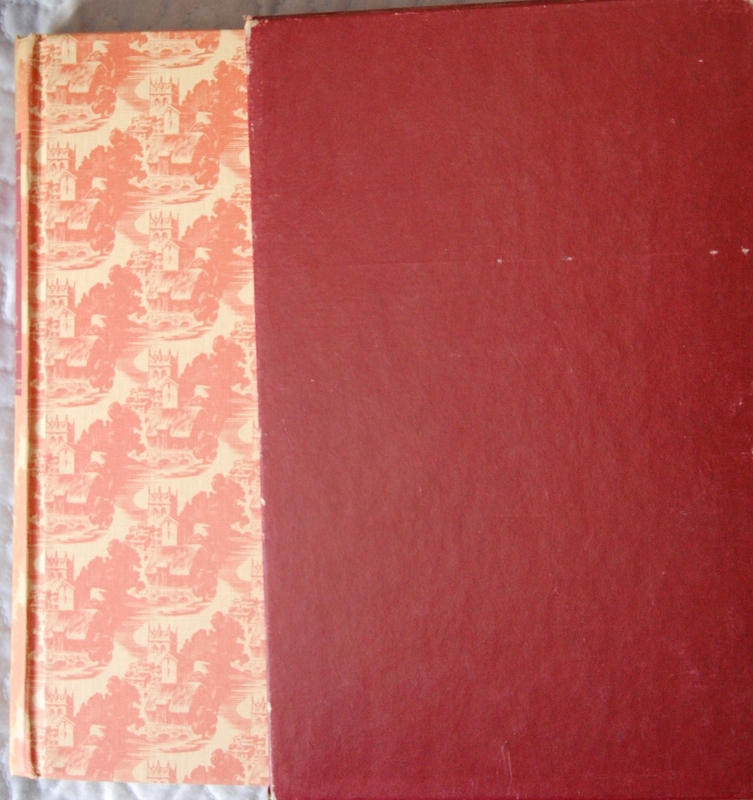 Front Binding – I absolutely adore this particular binding. 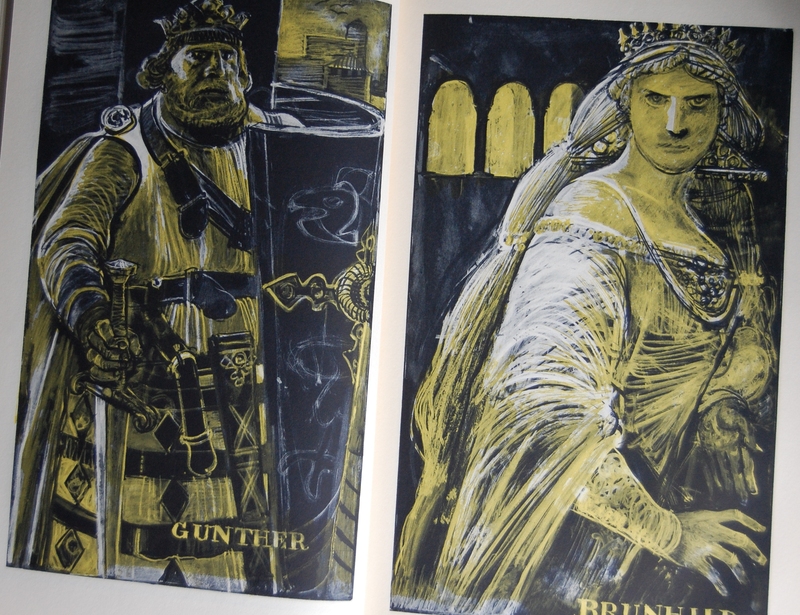 It’s extremely classy, and gives this German epic a wonderful first impression. The green, silver and dark brown (Rache-black the Sandglass says) are just beautiful. Designed by Arnold Bank (the interior by Jan Van Krimpen, finished before his death), this is a lovely tome and one of my favorites in the Heritage canon. As for the epic itself, The Nibelungenlied has a fairly involved history, which the Sandglass gives in a fashion better than a summary of mine could create. Instead, I’m going to focus in on its illustrator, the wonderful Edy Legrand. I’ve not had a chance to introduce Legrand to you, and that’s a tragedy I plan of resolving today. 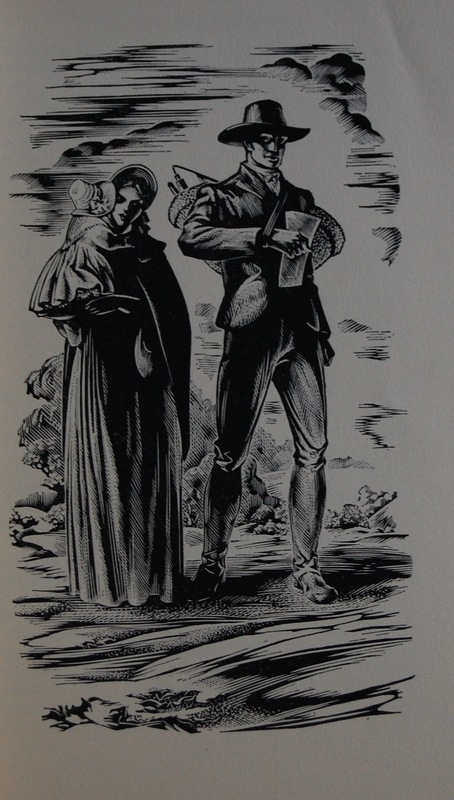 Legrand began his George Macy career in 1939 with his spin on Hamlet for the Bruce Rogers-designed Shakespeare LEC set, followed in 1942 with the Heritage A Woman’s Life by Guy de Maupassant (later printed by the LEC in 1952). 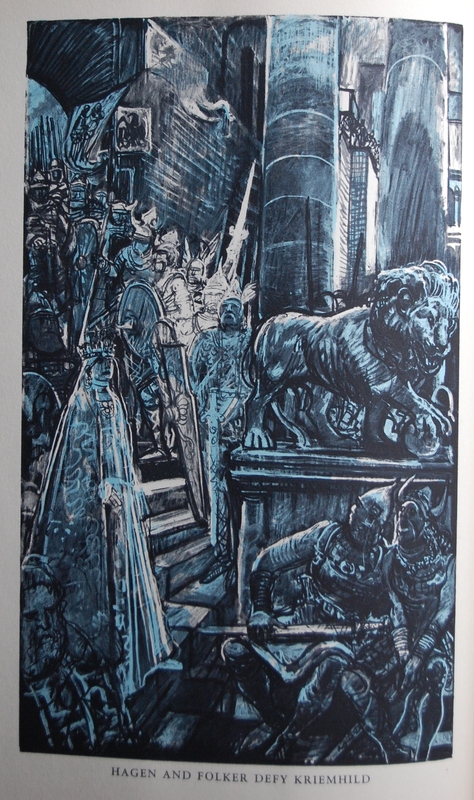 Legrand would go on to be quite prolific in his artistic contributions to the Company, illustrating Beauty and the Beast for a set of Evergreen Tales in 1949, Don Quixote in 1950, Travels in Arabia Deserta in 1953, The Three Musketeers in 1953, Twenty Years After in 1958, The Confessions of Saint Augustine in 1962, The Man in the Iron Mask in 1965, and Marguerite de Valois in 1969 for the LEC, with no other Heritage exclusives. Rendering some of literature’s biggest names (Shakespeare, Dumas, Cervantes, de Maupassant, Saint Augustine) for the Company must have been such a thrill for Legrand to perform, and his work for Dumas’ novels are some of the more exquisite books I’ve seen, particularly The Three Musketeers. He passed away in 1970. 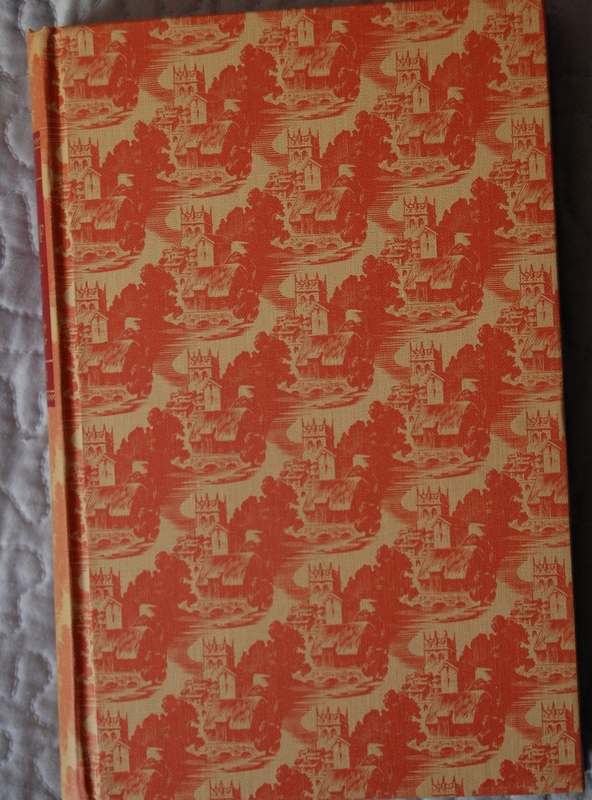 I’ve owned only two books with Legrand’s name attached – this and a lousy copy of Hamlet, which I’ve been attempting to rediscover to take pictures for you. 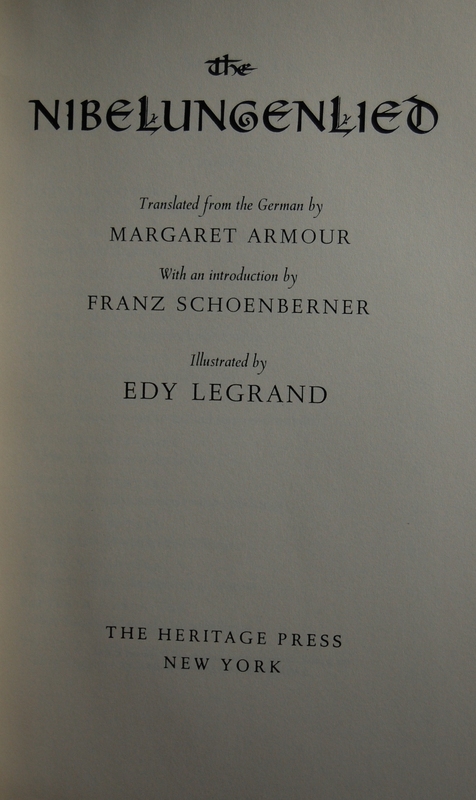 Title Page – The German was translated by Margaret Armour, who was busy doing this kind of thing to other epics tied to this one (from what I can gather from the Goodreads page, at least). She also translated Heinrich Heine’s poems and was a poet herself. Franz Schoenberner offers an introduction. For design notes, Van Krimpen went with Romulus for the majority of the text, recruiting S.L. Hartz to render the title and chapter initials in a very distinctive style. The New York Lithographic Company printed the book on paper from the Crocker-Burbank Company, and it was bound by the Russell-Rutter Company. It’s a fairly large book, one of the taller ones in my collection. Page 1 – 2 – Legrand begins the epic with a dynamic collection of the major players. 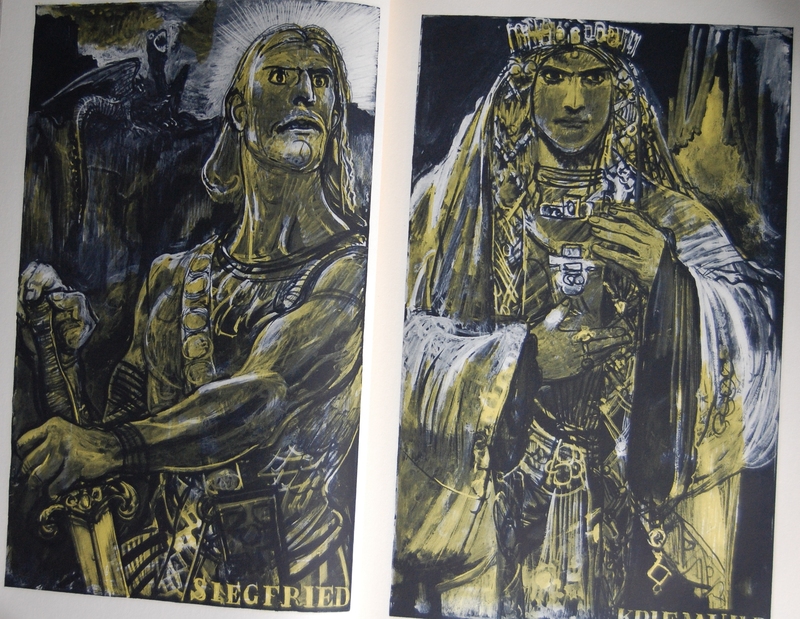 These drawings were printed by the Photogravure & Color Company. He went with a base black for one of the two colors, with a shade ranging from yellow to rose to blue for the other. 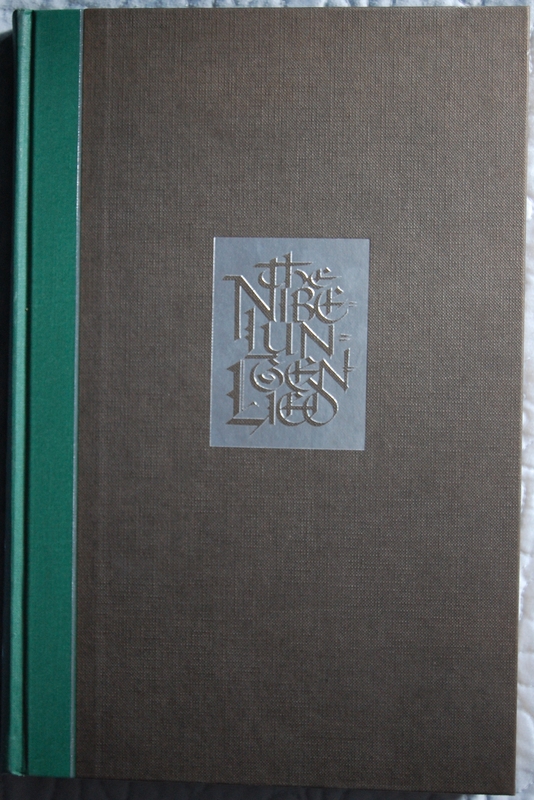 Legrand was very pleased with the quality of the illustration printing (saying “no one on the Continent could have done a better job”), but I have a hunch he was referring to the LEC edition, not the Heritage reprint. Still, they are nice! Page 193 – An example of the blue. 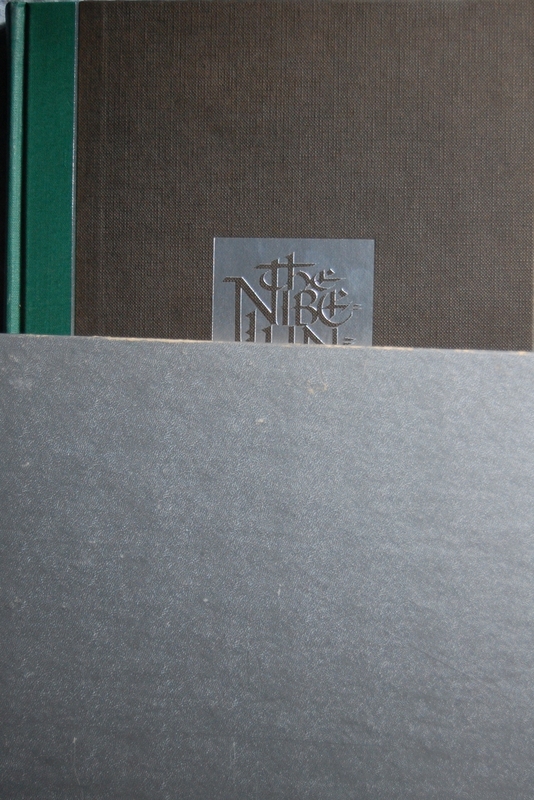 Personal Notes – I spotted this book right off in my favorite haunt in Monterey, and immediately purchased it. I’m glad I did, as I’ve not seen it anywhere else since. Definitely want the LEC! If you have a LEC copy, please drop me a line here or through the comments at my thread about this blog at the George Macy Devotees @ LibraryThing! I’d love to compare! Front Binding – Welcome to our third post on Thomas Hardy’s novels done up by the George Macy Company (The Return of the Native and Far from the Madding Crowd preceded this). With my discussion on both Hardy and Agnes Miller Parker being well documented in those posts (and Parker elsewhere), we’ll just focus on the book. 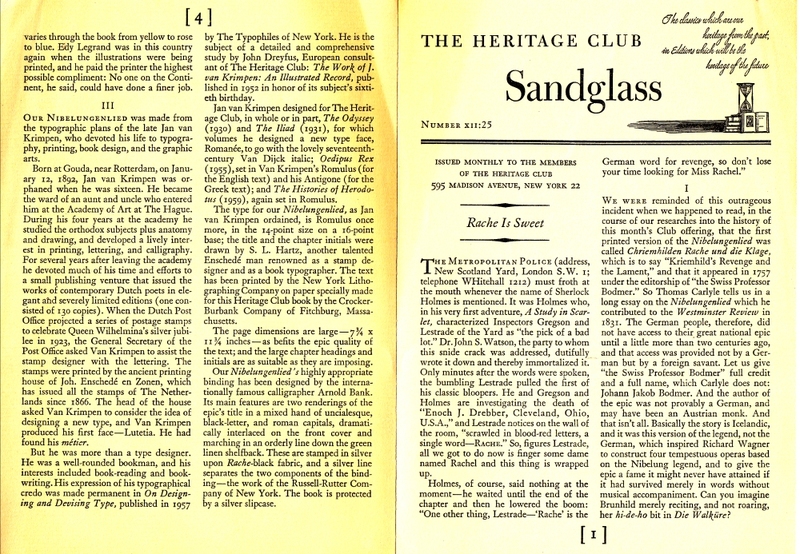 I was not gifted a Sandglass with this book, but I do know who designed the later Jude the Obscure – John Dreyfus. Odds are good that he designed this one as well based on A.G. Hoffman’s Native design from the ’40’s. 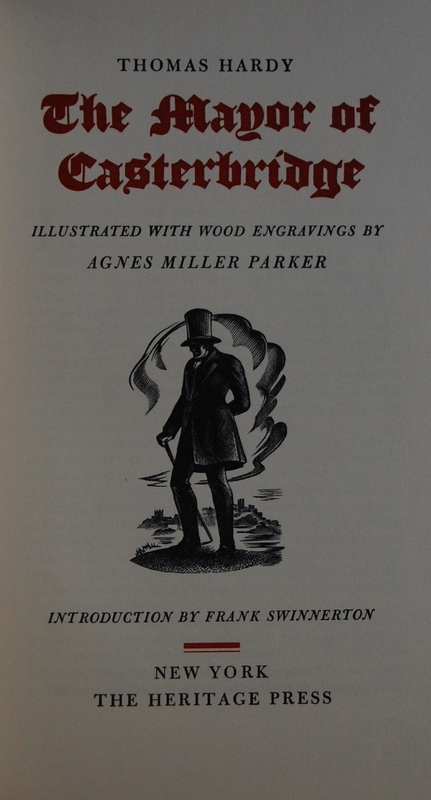 Title Page – Parker continues to wow with her work – I adore her woodcuts. 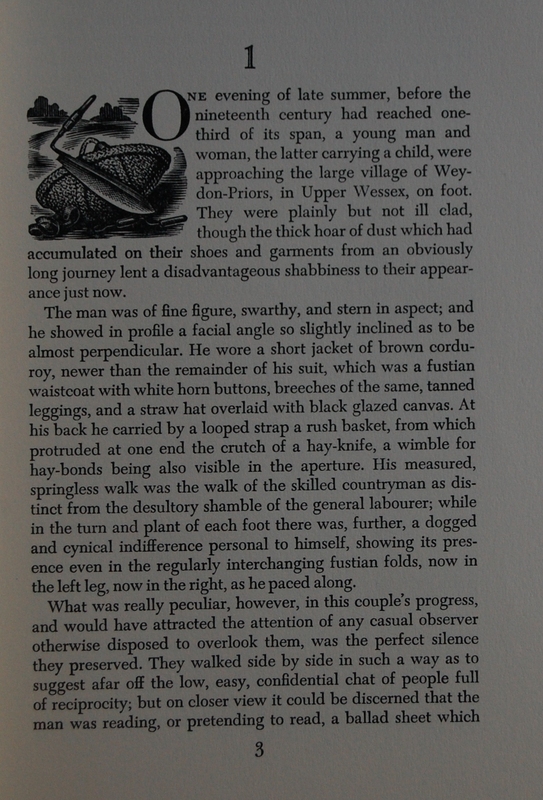 Anyway, Frank Swinnerton offers his thoughts for the introduction. 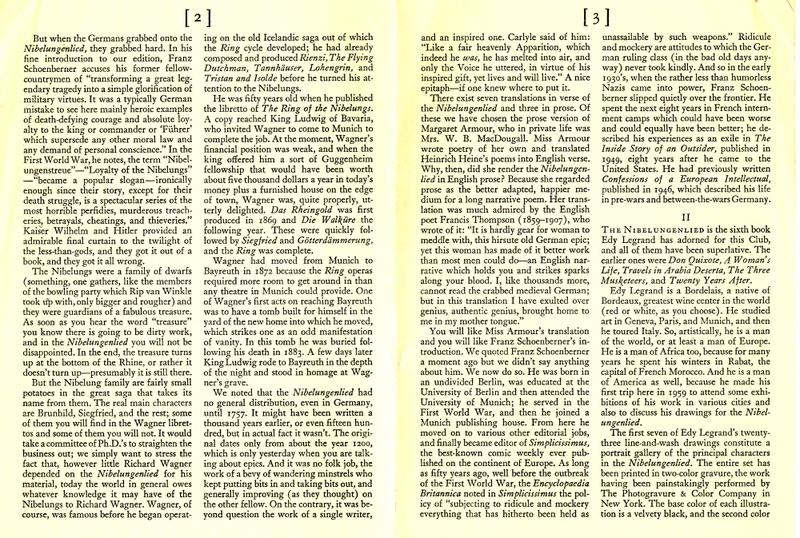 Page 3 – Parker did smaller chapter opener woodcuts on top of full-page ones. Page 6 – Lovely stuff. Personal Notes – This copy was once mine, but it lacked a Sandglass and wasn’t in the greatest condition, so I sold it off. Plan on reacquiring it in the future, though! 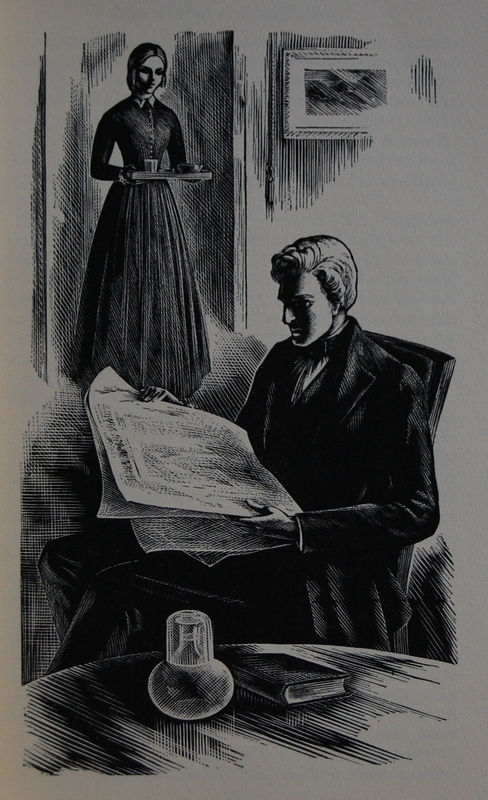 If you have a Sandglass or comparisons to the LEC original, please drop me a line here or through the comments at my thread about this blog at the George Macy Devotees @ LibraryThing! I could use extra insights into this book. Thanks! You are currently viewing the archives for November, 2011 at The George Macy Imagery.